Washer-disinfector Indicator RIKEN CHEMICAL Co.,Ltd. The Standard for perfect sterilization administration upon next generation. Our concept is that the real Sterilization starts in process of washing, unless works well upon washing disinfection process, affects a lot for the next sterilization process. 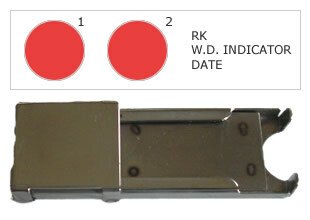 We developed a high performance double spot indicator locked in wink metal holder (Model : M-H) covering spot-1 and open for spot-2 as photo as wink style. Spot 1 : water stream is hit indirectly, while spot 2 is directly hit. The way of set-up is very easy as putting one or several M-H with indicator on each metal basket in washer disinfector. Red indicator color in both of spot are made of plant-protein originally developed by our new concept as ; a correlation between the remained protein coatings and protein derived from blood on medical tool. Also, there is a high correlation between the remained protein coatings and color-difference of remained protein-coatings, so LC-WD is effective for administration of daily ablution work. The detailed explanation with test data is ready to be provided by email attached file in power-point software. No good as less water stream as not well working spray-arm etc. Customized Color Check Sheet : We really recommend to prepare the Customized Color Check Sheet, because there is so many kinds of Washer disinfector even same maker has several kinds, usually each Maker of WD has such checking system for the remained protein on metal medical items, as process as measuring by absorption spectrophotometer with some sodium hydroxide, for the sake of adjusting Water power and Detergent. When enough satisfied for the remained protein on each WD, make your original check sheet=color change table of LC-WD. <Attention> Not necessary to be completely white=color disappeared, depending on WD, Light pink shows a good washing process. As option, providing Colorimeter for more accurate check by figures as well as with amide-black 10B.